The fifth movement is in two big parts. Second Part: …It’s party time! 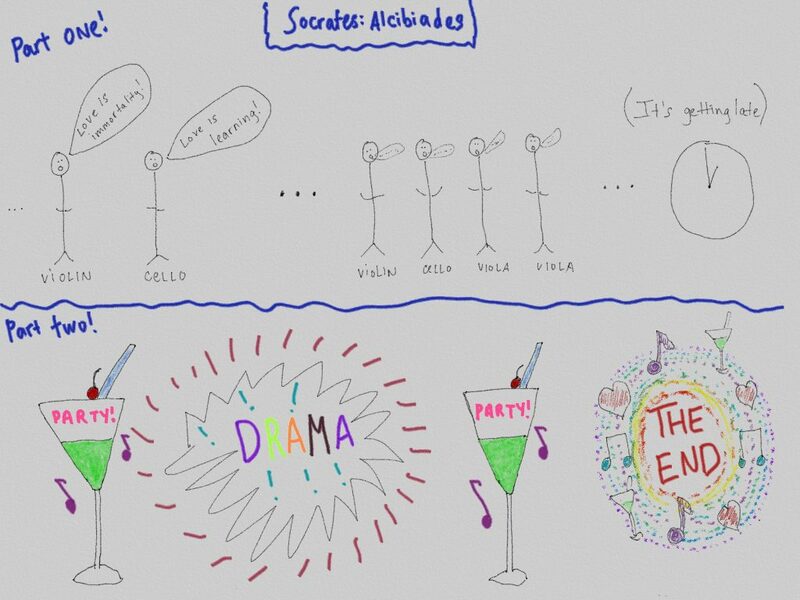 In the Symposium, as the speeches are winding down, drunk Alcibiades crashes the party. A few minutes later, even more drunk revelers arrive. There’s lots of flirty, witty banter. Bernstein lets loose in all his rhythmic, jazz, playful glory. It’s like he’s time-traveled the party to his own era and provided the soundtrack. I can almost imagine Socrates and Agathon in their ancient Greek garb drinking and smoking and mingling with 1950s-clad artists and musicians in Bernstein’s New York City apartment. The second part has four sections. The first (4:38) and the third (7:34) are exactly the same, and they are overall joyous. The second is short (7:16) and provides a bit of contrast (LB writes “with violence!”) and the fourth (9:28) is the big ending, summing it all up by combining lots of musical quotes from all of the other movements, swirling around in a big McFlurry of happy energy.